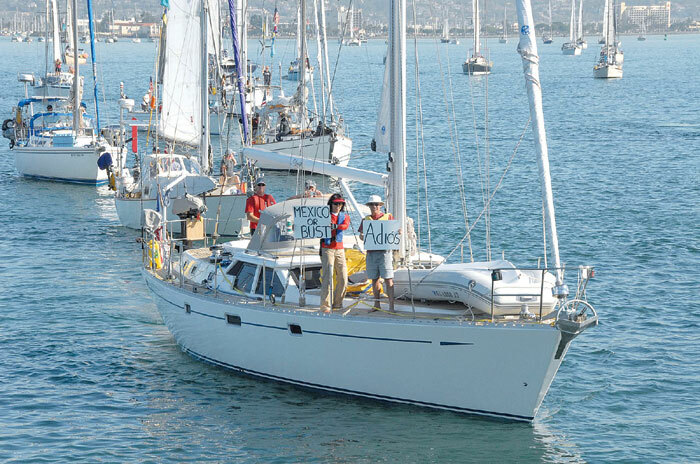 SAN DIEGO — More than 150 sailboats headed out of San Diego Bay Oct. 29 for the 19th annual Baja Ha Ha Rally, featuring a 750-mile cruise to Cabo San Lucas. The cruise marks the end of the hurricane season on the West Coast, and this year, the starting line was set off Shelter Island, marked by the sportfishing vessel Dolphin. Lou Smith, chairman of the San Diego Board of Port Commissioners, used an America’s Cup starting gun to signal the start sequence for the event. “The cruisers are off on a great adventure — some for a few weeks, and some for a few years, or longer,” said John Arndt, associate publisher of Latitude 38, which sponsors the rally each year. Since its beginning, more than 2,500 boats have entered the event, with more than 9,000 participants aboard. The group will arrive in Cabo San Lucas Nov. 9 for a beach party, followed by an awards presentation the next day. After that, many participants then part ways: Some head into the Sea of Cortez and the La Paz area, some head farther south to the Panama Canal, and some venture toward the South Pacific. For more information on the event, visit baja-haha.com.